Not much is currently known about Vance’s horseless carriage, but this is one example of what automobiles looked like around that time period. They truly looked like horse-drawn carriages without the horses. 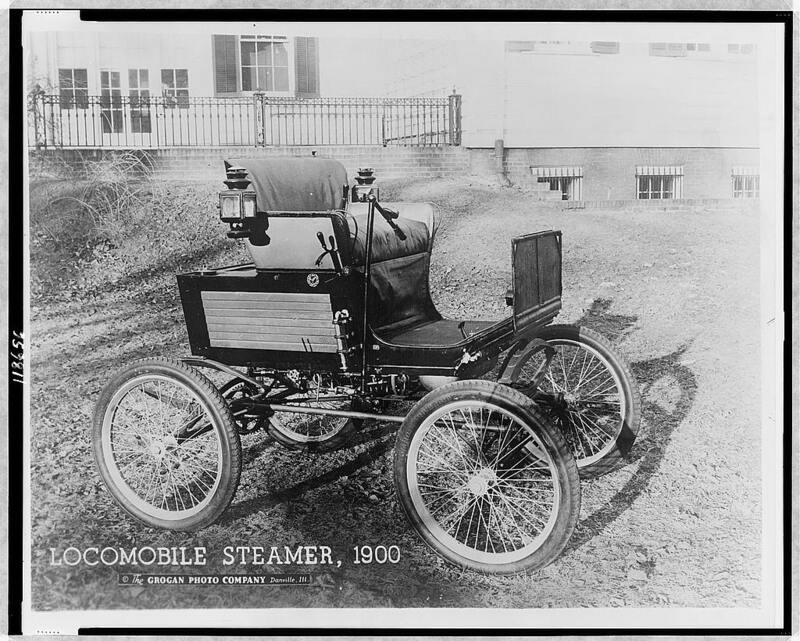 Photo courtesy of the Library of Congress(“Locomobile Steamer, 1900”). The original program for Patent Applied For shown at the Smith, courtesy of the Geneva Historical Society. There are many plays that can easily fit into just one genre. Patent Applied For is no such play. A melodrama about an inventor, the play was also a community event and a sort of advertisement for one of the most important inventions of the time. It was performed at the Smith Opera House on Friday, January 28, 1898, and featured H.H. Horton as Henry Milburn, the inventor (Patent Applied For). In the play, Milburn has invented an automobile, and sets out to patent his invention. The plans for Milburn’s automobile are tragically stolen by the villain, however, throwing the play into an unexpected conflict (The Opera Glass). Elmer E. Vance, the playwright, mirrored his protagonist in that he had also created his own automobile. In fact, “in Act I, Elmer Vance’s Wonderful Horseless Carriage [was] exhibited in operation” (Patent Applied For). Through the use of the automobile onstage, the play becamemore than just a melodrama. It was a showcase for the new horseless carriage, advertising the advances in transportation technology. To further sell his play, Vance gave rides in his horseless carriage prior to the play’s start. Unless the weather had prevented it, people would have indeed ridden the streets of Geneva in Vance’s contraption (“At the Opera House”). That interactive of Patent Applied For is what truly made it a community event. not just another play. Its unique combination of a melodrama, a showcase and an interactive ride makes it a fascinating moment in the rich history of the Smith Opera House. “At the Opera House.” Geneva Daily Times, 26 Jan 1898. Rochester Regional Library Council. NYS Historic Newspapers. “Locomobile Steamer, 1900.” Photograph by the Grogan Photo Company, Danville, 1944. Library of Congress Prints and Photographs Division, Washington, D.C., https://www.loc.gov/item/97512732/. Patent Applied For. 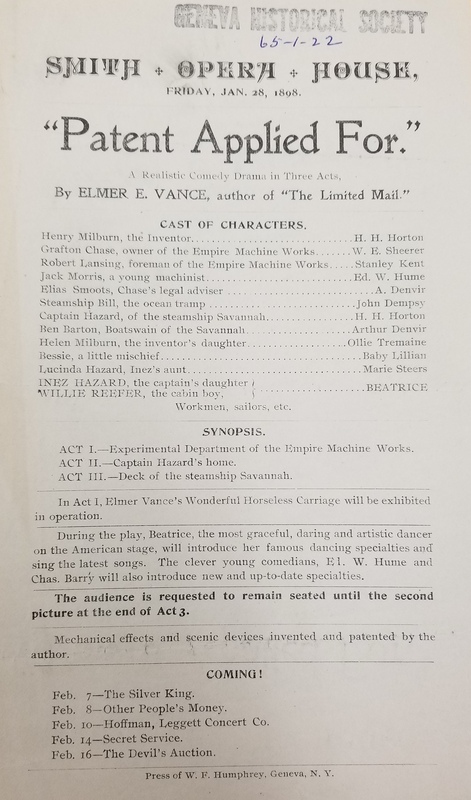 Program, Smith’s Opera House, 28 Jan 1898. Geneva Historical Society archives, collection 78, box 1, folder 2.